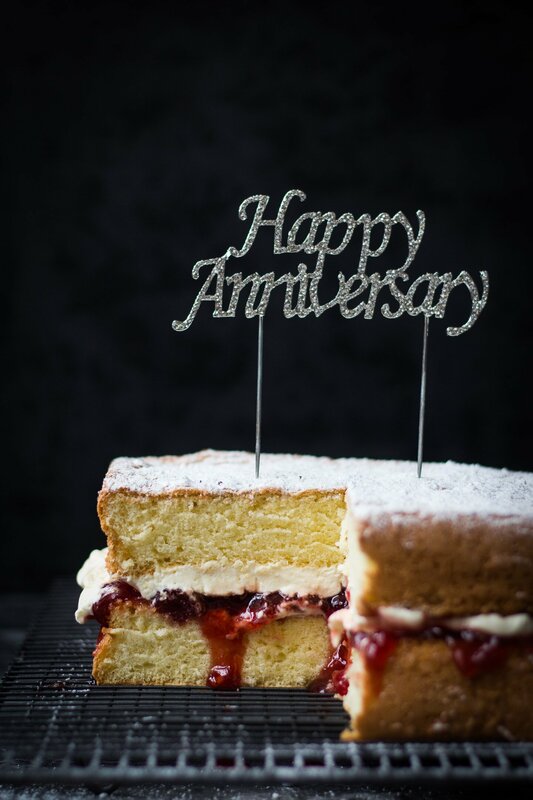 This month marks the one year anniversary of my food blog. What started as a fun side hobby between school drop off and pick up times quickly developed into a full blown passion for food styling and photography. What a delicious and exciting journey the past 12 months have been. 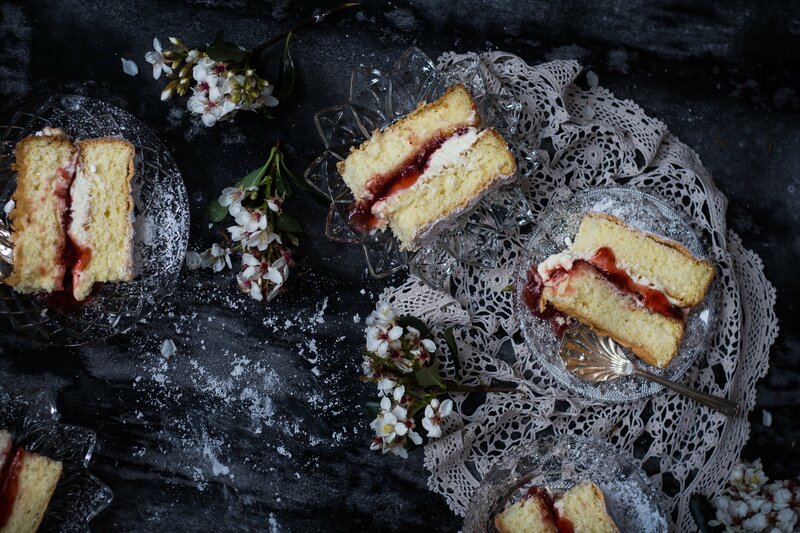 To celebrate my blog’s first birthday I decided to go back to basics and bake the quintessential celebration cake – a classic gluten free Victorian Sponge Cake with Jam & Cream. 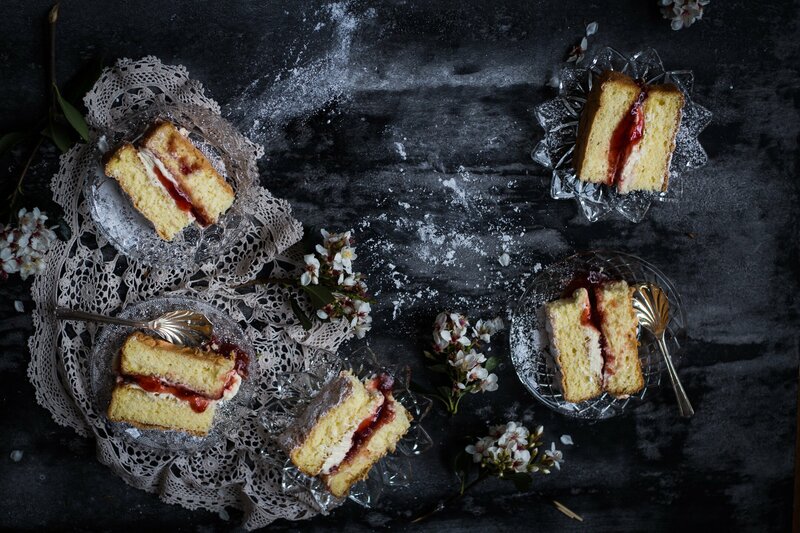 What’s not to love about soft as a cloud spongey layers sandwiched together with lashings of whipped cream and homemade jam? The key to a great sponge cake is air, lots and lots of it. You need to work quickly and gently to ensure you incorporate as much air as possible in each stage of the baking process. 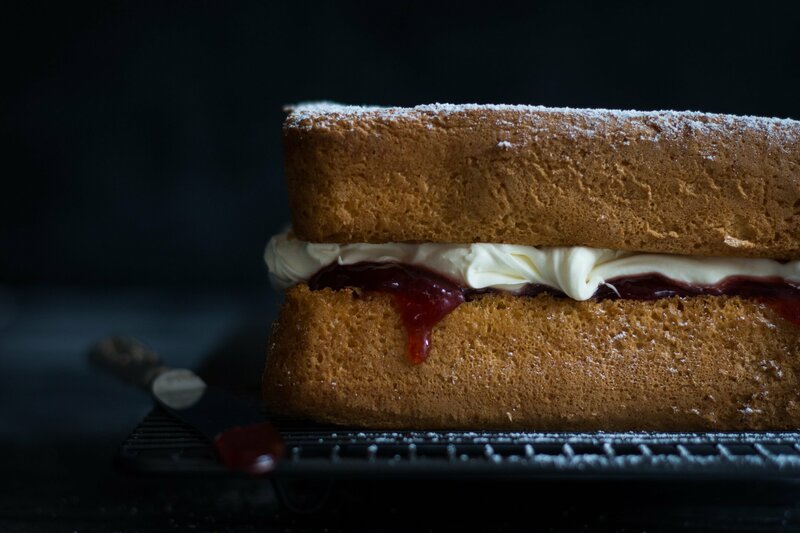 Sponge is quite a simple cake to master and perfect for those new to baking as there are only a few pantry staple ingredients and simple rules to follow. Ensure your eggs are at room temperature because cold eggs will not incorporate as much air as room temperature eggs. Triple sift your flour to guarantee a light and fluffy texture. Don’t skip this step it is critical. Very gently fold the flour through the batter one third at a time using a thin rubber spatula to retain air and distribute the flour evenly. To begin with just fold through a tablespoon of flour at a time to make it easier to incorporate into the batter. As you are folding ensure you are scraping the bottom of the bowl as the flour tends to sink to the bottom so you need to catch the flour to avoid flour clumps in your sponge. 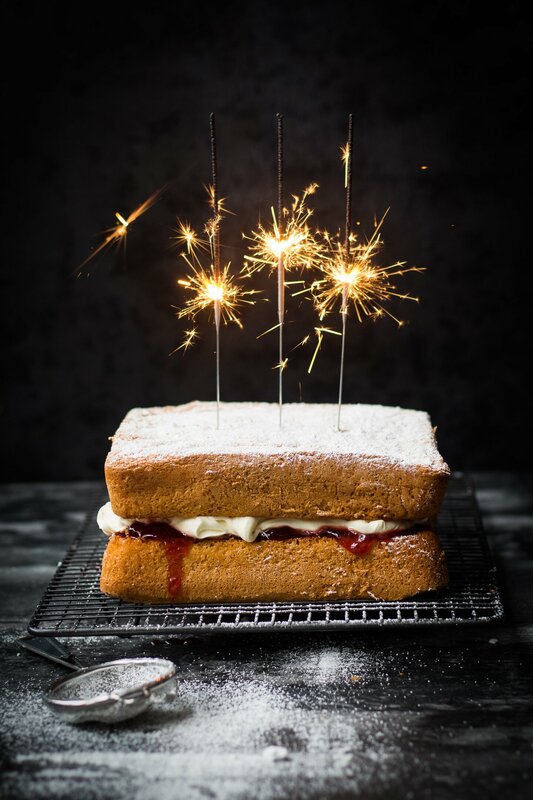 This gluten free recipe will quickly become your new favourite basic birthday sponge cake recipe. All you need to do now is put the kettle on and bookmark under ‘tried and tested family classic’. Enjoy! Whilst the egg mixture is beating triple sift potato starch and corn flour together in a separate bowl. Sift the flour over the egg mixture one third at a time and gently fold through the batter using a thin rubber spatula. To begin with just fold through a tablespoon of flour at a time and ensure you are scraping the bottom of the bowl with your rubber spatula to catch any flour clumps. Fold through the melted butter. Pour half the mixture into each baking tin and bake for 15-20 min or until cakes are springy to touch. 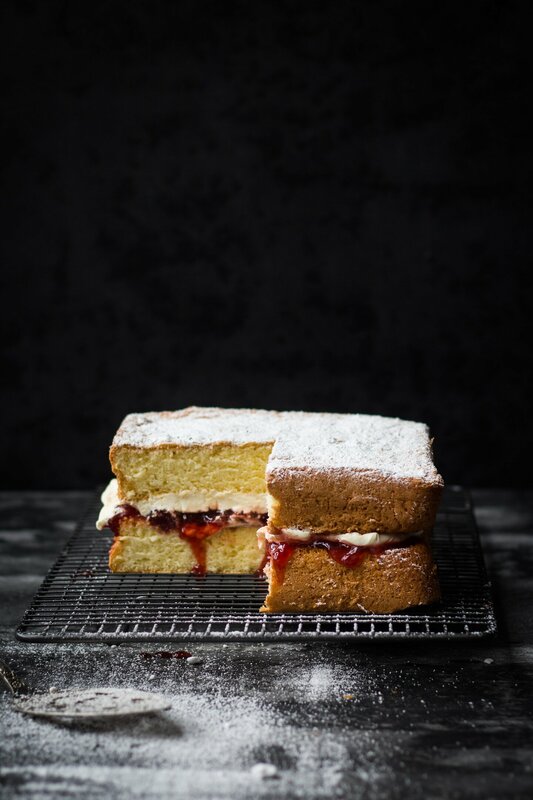 Transfer to wire racks and spread jam over one sponge cake whilst still warm to allow jam to soak into some of the sponge. 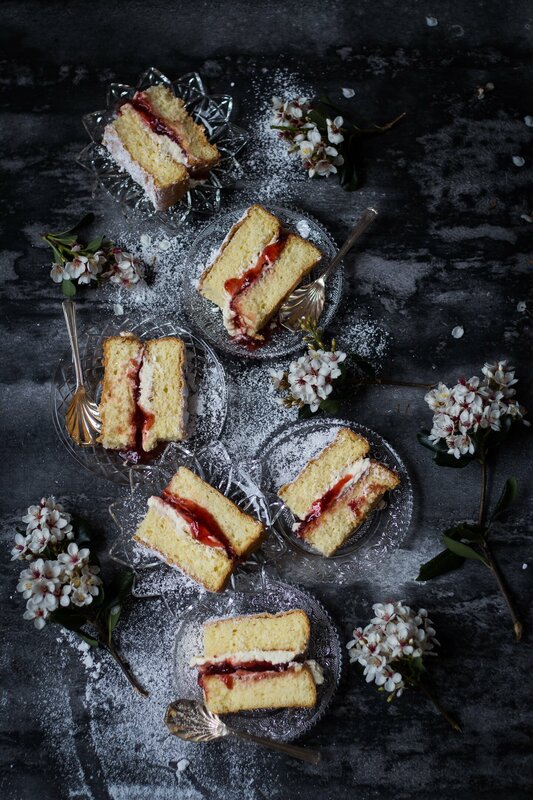 When cakes are completely cool add layer of cream and sandwich together. Dust with icing sugar to serve. Combine potato starch and cornflour in Thermomix bowl and mix 10 sec/speed 5. Set aside and clean and dry Thermomix bowl. Insert butterfly into mixing bowl and beat eggs, sugar and vanilla extract 5 min/speed 5 with MC removed. Transfer mixture to a bowl and very gently manually fold the flour through the egg mixture one third at a time with a thin rubber spatula (as per conventional method) to retain as much air as possible. I find the manual method works best here to retain maximum air and a fluffy batter. To begin with just fold through a tablespoon of flour at a time and ensure you are scraping the bottom of the bowl with your rubber spatula to catch any flour clumps. Once flour has fully incorporated into batter add melted butter. Such a beautiful cake! Perfect for a party. Happy Birthday Helen!! You have done an amazing job this last year. Your blog is beautiful. Love all your photos and recipes – especially the Thermomix ones. Thanks for your lovely words Sia. Happy cooking!! My friend swears by a similar recipe and her sponges taste great! I have no idea that I am eating a gluten free sponge! 😀 Congratulations on your blog birthday! Thanks for your lovely comments and congratulations to you on your amazing success. Thank you for this recipe. I would love to make it but have 2 questions please. 1- The traditional VS has the eggs measured in the shell, as eggs differ in size should i just use 6 eggs or mature them.. some of my eggs are really big lol! 2- Is there no raising agent? GF gluten powder maybe??? Yes you can increase by 30% but the two cakes layered together are already quite tall. I’ll leave that decision to you. Nargess I just use medium size eggs. I will update the ingredients to reflect this. If your eggs are extra large you could probably get away with one less egg. There is no raising agent, sponge cakes do not need it because there is alot of air in the batter. Proper mixing time in the first step is critical, don’t rush it. So glad you enjoyed it Alex. Trial and error is the best way to learn. happy new Year!! This is my coeliac daughter’s new favourite cake, thank you!! Looking forward to trying your chocolate sponge next. Thanks Donna so glad she loves it Enjoy!! Most kids love the Apple Cinnamon Teacake too because it’s very light. Hello. Thanks for the recipe. I’ve made this cake twice and quite like the flavour and texture. The one step I found a little difficult was folding the flour through the batter without knocking out all the air. I found the flour kept clumping and coating itself in the batter making it difficult to break it up. I had triple sifted and slowly folded through, but it was difficult to get it clump free. Any suggestions ? Hi, At the moment we have to be maize/corn free as well as the gf. What is a good substitute for the cornflour? I have tapioca starch, rice flour, sweet rice flour and teff seeds I could crush. You could try sweet rice flour I have not tried this combo so can’t guarantee the final result. Let me know how go. Is there an alternative to potato starch? I am in Australia and have tried to find it in my local stores and can’t seem too. You can find potato starch flour at any health food store or online at organic shops. This looks amazing. Do you think I could take the recipe and make it into cupcake without any alterations? They should be fine but the cooking time will be less just check them at 10 minutes. Insert a skewer and if it comes out clean they are ready. Wow, I love this cake! Do you think I can make it into cupcakes without any amendments to the recipe?